With the Reveal PRO from Seek Thermal you are prepared for all eventualities. With the high-performance resolution of 320 x 240 pixels, you won't miss anything, even in complete darkness. With a wide detection range from -40 °C to 330 °C, you can set the temperature range you want to highlight, even under extreme conditions, with the intuitive software. Simply set and save the heat level and temperature range and the Reveal PRO will show you the desired key data with a color highlighting. Predefined settings allow you to easily calibrate your Reveal PRO. In this way, you always set the sensor to a degree of compensation appropriate to the environment. Whatever the surface properties of the scenery, make sure your measurements are accurate and precise. From simple gray to the highest contrast, the Reveal PRO provides many visual display options to help you read and interpret your measurement results. The 32° wide viewing angle with the possibility to use a quadruple digital zoom allows you to scan even large areas and recognize potential dangers immediately. If you do need light, you can switch on the built-in 300 lumen LED by simply pressing the soft button. 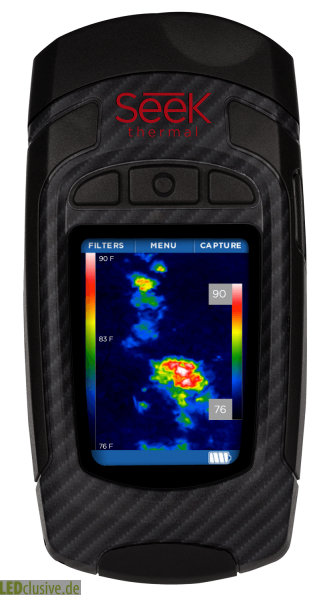 The adjustable temperature range, 32° viewing angle, emissivity settings and top-quality materials make the Reveal PRO the leader in high-resolution thermal imaging cameras with unparalleled software expertise. A comparable product at this price is almost untraceable. Designed and manufactured in Santa Barbara, California, the Reveal PRO stands for Seek Thermal's corporate motto: Payable high performance thermal handhelds. Accordingly, shipping to third countries (not EU countries) may not be possible.